FOR IMMEDIATE RELEASE - Santa Barbara, April 1st, 2016 - The Santa Barbara Museum of Art (SBMA) is a great source of pride for Santa Barbara residents, with its massive art collection coming from Asia, Europe, and the Americas that spans over 5,000 years of human history and creativity. Its permanent collection includes more than 28,000 works of art ranging from paintings, drawings, and photographs to textiles, ceramics, and sculptures. Over 150,000 visitors drop by SBMA to marvel at exhibitions and participate in activities each year. It also spends approximately 20 percent of every dollar earned on learning programs as it provides education to more than 40,000 people in Santa Barbara County every year. But since opening in 1941, the Museum has yet to undergo a comprehensive renovation. Leaks have been plaguing the roof of the SBMA and the aging mechanical system is in urgent need of replacement. The Museum also has insufficient storage and conservation space for its growing art collection. In order to safeguard its permanent collection, the Museum has launched the "Imagine More" campaign, a $50-million capital campaign that aims to renovate the SBMA and preserve over 28,000 precious works of art through much-needed seismic retrofitting. The art receiving facility and other gallery spaces will also be reconstructed in order to put more of the permanent collection on view. This will result in 25 percent more gallery space, increased community spaces, improved safety, and overall enhanced museum experience for patrons and employees alike. But aside from addressing the critical needs of the facility, the renovation plan is also committed to environmental sustainability. One of the Museum's goals is to meet the Leadership in Energy and Environmental Design (LEED) standards, a green building certification program that recognizes best-in-class building strategies and practices. Obtaining the LEED certification will mean long-term energy and efficiency savings for the Museum. "The plan is a remarkably smart use of space that will do justice to the very fine works in the collection," said John Walsh, director emeritus of the J. Paul Getty Museum. "What's more, it will provide a coherent experience for visitors as they move from gallery to gallery." 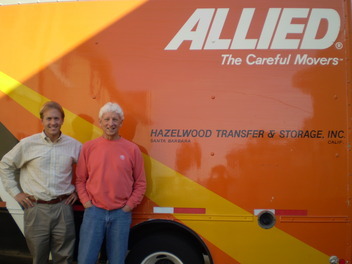 The Museum has enlisted the services of Hazelwood Allied, a moving company in Santa Barbara, to assist with their moving and storage needs while the renovation is taking place. The Santa Barbara moving and storage company owns and operates five well-maintained warehouses in Santa Barbara and Carpinteria, in addition to a self-storage facility called McCann Mini Storage. "We are grateful to be selected by Santa Barbara Museum of Art as their moving team of choice for this project. We cherish the trust they place in us. Our staff takes tremendous pride in our integrity, sound work ethic, and commitment to the safe transport of high-value shipments, where security and efficiency are the highest priorities," said Casey McCann. The renovation, enhancement, and expansion of the Museum are anticipated to take approximately six years, as work will take place in multiple stages to allow for continual occupancy of SBMA and its galleries throughout the construction. The first stage, which includes roof replacement, seismic retrofitting, McCormick gallery renovation, the creation of Contemporary Art Gallery, and renovation of facilities, has already started last December 2015 and is expected to be completed within 18 months.